Summary: He is a Legend. 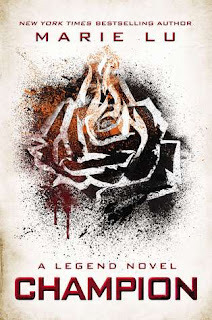 My Thoughts: When I read Legend, it was exciting and one of my favorites of the year! I am finally done with the series! When I started Champion, I wasn’t sure to think. We are right back there with June and Day and neither of them are really enjoying life. They are living life without each other doing their own thing. They both have their own battles they must face. I don’t want to say very much about this one in this review incase you haven’t started the series yet. I thought the first part was good, than towards the middle it got somewhat boring and I felt like I wanted it to speed up. And then the end, it got a lot better. It just had a very slow middle and I almost put it down completely but I needed to know how this series was going to end. I really enjoyed this series but the last one was my least favorite. However, I did really enjoy Day and June again and Day’s little brother. I also really liked the last few pages of Champion! Loved those! Overall: I liked this one but not as much as the first two. I’m glad how things ended up though. Nice story!!! One of my favorite series of all time! I think this is more of a 3.5 cupcake rating for me! Cover: I like it! 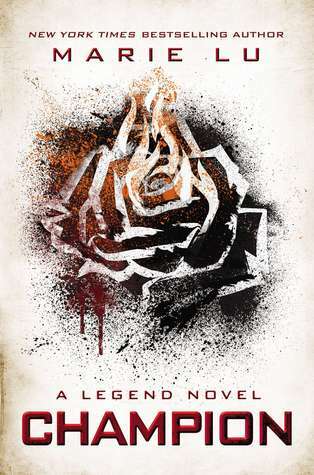 I think Legend has the best cover though! It's such a great series. I'm glad to see you enjoyed this one! I really want to check out this series.